Last week, hubby and I were talking about Jasmine’s long journey to good health. He noted that she hadn’t had an abscess in a very long time and he hoped that whatever was in her paw had finally worked itself out. Well, I believe we tempted the Abscess Fates because this morning, I found another abscess on Jasmine’s paw. Since this is one of the top search terms that people use to find this blog (believe it or not), I decided to take a picture of it to show you what it looks like. Taking care of Jasmine’s abscesses has become less threatening because we know what to expect. She’s going to lick it, it’s eventually going to pop, I will dress it with warm compresses and extract some of the puss inside, and it will heal. I think she’ll continue to have these throughout her life. It’s just something that’s going to happen with her. As long as it doesn’t get to a point where she’s limping (which will indicate that she’s in pain due to infection), she’ll be fine. If she does, we’ll have to take her in for a round of antibiotics. Awww… poor baby.. hope it heals soon! Would you tell me what give your vet to jasmine? Sorry for my english, I’m french!!! Please don’t worry about your dog’s abscess. If the veterinarian has looked at it, your only worry is if the paw becomes infected. After numerous abscesses, I have learned that Jasmine will take care of it. It gets very large, it pops, I clean it and let it drain. It heals on its own. IF your dog is limping and shows that the paw is painful, THEN you need to take him/her back to the vet for treatment. Jasmine’s vet gave her an antibiotic when her paw became infected…otherwise, I just let her take care of it on her own. The problem is called “interdigital cysts” and will recur on a regular basis for Jasmine. Thanks for your information. My dog has one also which he has had for quite some time. it pops and drains and then it swells again. I am reluctant to take him to the vet as the last one he had they cut out and it was a terrible experience. Do you know of anything else I can use that is natural? Abscesses can be caused by many things. Our vet told us that this will happen over and over, and in most cases the dog will take care of it on its own. Jasmine certainly has, and the only time I’ll intervene is if she starts limping and really showing pain (that signals infection). The last one she had was a few weeks ago, this time on her left rear paw, took a bit to pop. I had to help it along, and i was very tough to drain and took a long time to reduce. If the vet had to cut out your dog’s last abscess, it could have been caused by a foxtail–very different from Jasmine’s “non-specific” case. If a foxtail doesn’t work it’s way out, it’ll have to be removed (hence your last experience). Abscesses can also be caused by cysts…again, another reason they might have to remove it. I’d go back to the vet if your dog’s paw doesn’t heal on its own and talk about the causes and the potential ways to treat. You just don’t want to let it go if it gets infected. Thanks for posting the photo! Hope all is well with you! Well, I wish I had searched for this a week ago. 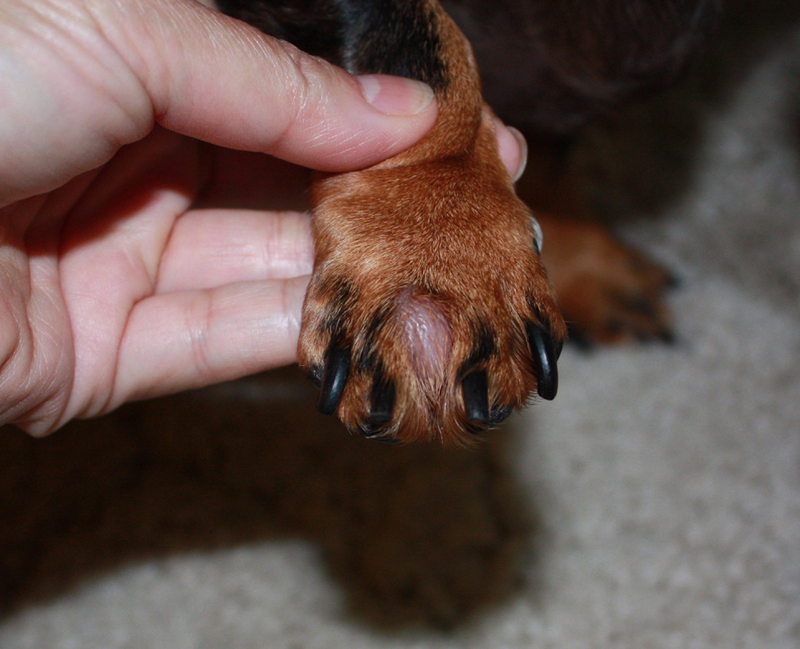 My pup – a dachs cross – has exactly the same swelling on his front paw. So good to know it’s an abscess – the vets have been talking about allergic reactions and all sorts! Over the last couple of days it started to go a bit crusty on the outside and it has literall just popped a bit. Now I know it’s an abscess I’ll continue to bathe it in warm salty water and let him take care of it. Thanks for the comment, Emily. Just remember to keep an eye on it. Jasmine’s abscesses have actually become more frequent and much worse over time, and she’s had to have antibiotics the last couple of times. If the swelling continues, if the swelling goes beyond the paw, if the popped abscess does not seem to relieve the infection, if it doesn’t start to heal…get your pup over to the Vet. You don’t want an infection to threaten the health of your pup, and while some of these heal on their own, others need a bit of help. Thanks for visiting and I hope your pup heals quickly! Hi, thank you for your reply. I will definitely keep an eye on it – it’s been a bit of a journey! Tiger, my pup, is only 14 months old and a rescue so his background is a little hazy. When Tiger was limping with no sign of an abscess he actually developed pustules all over his tummy along with a temperature which really threw both the vet and me. Whilst the anti-biotics bought his temperature down and cleared his tummy up, it didn’t seem to do anything for the swelling. I have since been back to the vet a couple of times like an over-anxious mother looking for answers!! Now I can see it’s definitely an abscess (and not broken bones, strange skin allergy etc etc) I can focus on bathing it and making sure it stays clean. Your photo helped immensely in that process! Out of interest, have either of your dogs got growths between their pads? Like an extra mini-pad between the large and small? I have been wondering if there is a link but the vet doesn’t seem to think it important. Poor Jasmine! I do feel for you guys!